My Weigh Triton Digital Scales are classic design pocket scales. It's thin, durable and accurate. Although the My Weigh Triton scales are small, their cover can be used as an expansion tray to make the weighing platform larger then most table-sized scales. The resilient integrated poly-case makes My Weigh Triton Digital Scales more durable than the other scales in their class. 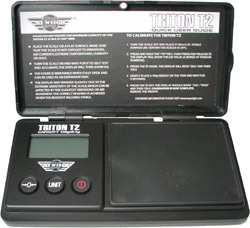 My Weigh Triton Digital Scales are also designed to be both durable and accurate.